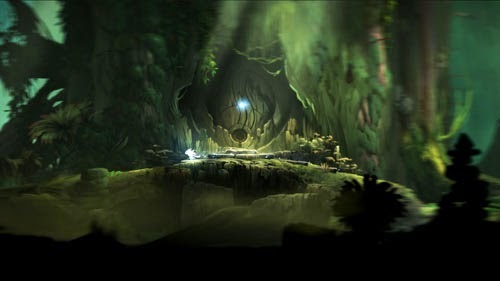 Ori and the Blind Forest: Definitive Edition, from Moon Studios (game site), is now available on Xbox One and is coming soon to PC via Steam. The new version arrives as paid DLC for owners of the original, or the full bundle may be purchased outright for new adventurers and includes two new areas, new attacking and movement abilities, and new story elements that expand on the original game. The update also adds difficulty settings and fast travel between areas. The game is an action-adventure platformer set in an atmospheric world. A creature named Ori explores the world and gains new abilities that allow him (her?) to reach new areas, while attempting to escape the claws of Kuro, the dark owl. The game puts platforming first with a capable character who is able to move quickly and reach great heights, jumping from walls and parachuting down through spike-lined caverns. Ori travels with a sentient ball of energy that acts as a guide and also a weapon, allowing players to attack nearby enemies without breaking stride. Ori and the Blind Forest was also our 2015 Game of the Year. Check our full coverage here.